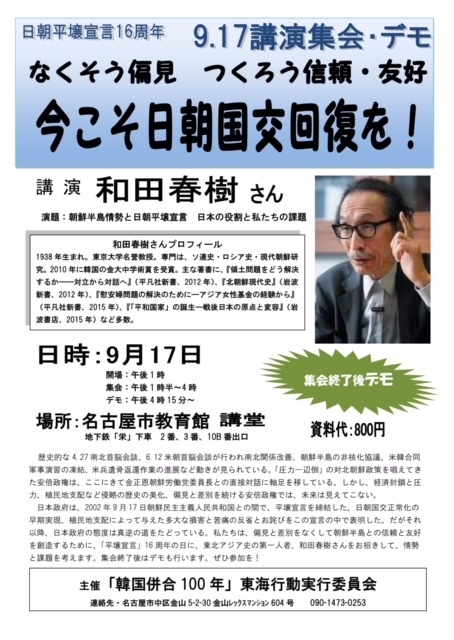 Wada Haruki lecture in Nagoya: "Now Is the Time for Rapprochement between Japan and Korea"
On the 17th of this month (September), the acclaimed Japanese historian Wada Haruki will be giving a lecture in Nagoya at the Nagoya-shi kyouiku kan at 16-6, Nishiki 3-Chōme, Naka-Ku, which is a short walk from Exit 2, Exit 3, and Exit 10b of the Sakae subway station. Doors open at 1:00 p.m.; the lecture begins at 1:30 p.m. There will be a demo for peace on the Korean Peninsula afterwards, starting at 4:15 PM. The title of his lecture is “Let’s End the Discrimination, and Build Trust and Friendship: Now Is the Time for Rapprochement between Japan and Korea.” The entrance fee, that also pays for copying costs for handouts, is 800 yen. Wada Haruki is an expert on Korean history and one of the most prominent experts educating Japanese about Korea. Born in 1938, he is a professor emeritus of the University of Tokyo. He has written many books on the history of the Soviet Union, Russia, and modern Korea. Joseph Essertier of World BEYOND War will attend his lecture and join other World BEYOND War supporters in the demo. Over the course of 2018 as well as in many past times of detente, the government of North Korea has made many concessions and demonstrated its sincere intentions to end the Korean War. The ball is now once again in Washington’s court. It is time for President Trump to make good on his promise, to offer Koreans in the north substantial security guarantees and to end once and for all the threat of violence on the Korean Peninsula between the “UN Command” states and the states that fought on the side of North Korea. The armistice of 1953 must now be replaced with a peace treaty and the immoral and illegal sanctions must be stopped so that Koreans in the north can communicate and exchange freely with people outside their country. Please come to this important event to learn about Korea, to share ideas with Japanese and others about how to build peace on the Peninsula, and to take action for the sake of one billion people in Northeast Asia whose lives are in jeopardy.